Wouldn't life be amazing if you could simply plug your brain in to the mains at the end of a long, tiring day and feel instantly recharged? Sadly, the reality isn't quite that simple. Right now, I have a lot in common with my iPhone battery. Let me explain. Even after hours of attempted recharging, my internal battery only makes it to the halfway point and when I hit 20%, I cut out altogether. And attempting to do more than two tasks? Forget about it, I crash as quickly as iOS when attempting to open more than one app. Sigh. Since my poor frazzled brain sadly can't get a Genius Bar appointment (more's the pity), I've been taking action myself in order to start recharging again. 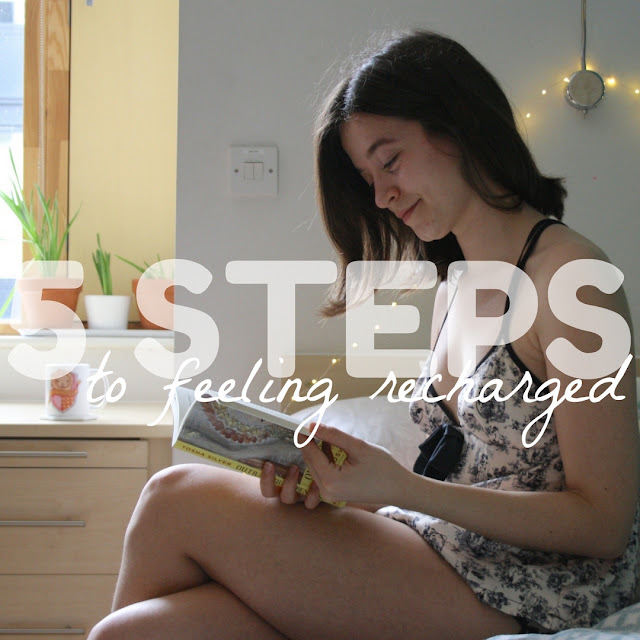 Today I thought I'd share my five favourite recharging methods. Sleep is probably the first thing you think of when the subject of recharging comes up, and for good reason! My bed is my oasis of solitude. I don't think there's anything better than snuggling down amongst a mountain of pillows to get some much-needed shut-eye, especially if you've taken advantage of Groupon's mattress deals. There is way more to decent sleep than just getting into bed at the right time, however. I like to start a slow-down routine half an hour or so before getting into bed to tell my busy brain that it's time to start switching off. A big mug of chamomile and spiced apple tea certainly helps, as does switching on my aroma diffuser. Currently I have a de-stress essential oil mix from Neals Yard Remedies on the go in my diffuser, which contains balsam and bitter orange scents. Breathing in these gorgeous smells makes me feel oh-so relaxed, as do the colour-changing lights within my diffuser. Alongside my fairy lights, these create a super chilled atmosphere, perfect for recharging those batteries. Another really important part of sleep in my opinion is having the right sleepwear. I'm modelling my favourite pyjamas from Ann Summers in the photos for this post. They're definitely a summery option with the cut-out back but I just love the silky material, it makes me feel somewhat sophisticated even when I'm going to bed! These particular PJs do have a little more to them than meets the eye though, a story which I'm sure will make you giggle. My Mum originally purchased this set of nightwear to take on holiday and was absolutely delighted with them, UNTIL she got them home. She then took a closer look at the pattern and realised that what she thought was just an innocent decoration was in fact comprised of lots and lots of copulating couples. Yep, my Mum had bought pyjamas with karma-sutra style pictures all over them. She then presented them to me with the words "I thought they'd suit you better". Thanks, Mum. Not entirely sure what she was trying to say with that statement, but remembering this puts a smile on my face whenever I pull the pyjamas out of my closet! But anyway, after this little humourous aside, let's get back to recharging, shall we? Have you ever tried yoga? After yoga retreat that I attended last summer in the gorgeous Portuguese countryside, I'm a total covert. Although I must admit that I sometimes lack the motivation to get on my mat. However, it is something that I really need to make more time for as the difference that it makes to my day is palpable. I love guided practices from Yoga with Adriene's YouTube channel because they are just so chilled! Adriene never puts pressure on you to achieve perfect postures during your practice, she simply encourages you to find what works for you and your body. I find this really refreshing because it takes the stress out of yoga and makes it into a uniquely individual experience. I really enjoy her yoga for sleep and yoga for relaxation videos as they really focus on breathing. Breathing from your stomach rather than from your chest makes an unbelievable difference to your mood, I feel so much more refreshed and revitalised after every yoga practice. Even if you don't have time for a full yoga session, a bit of simple stretching improves your circulation immediately, giving you a quick burst of energy - something to try when you're next in a pinch! Got a problem? Run as fast as you can! The route to feeling recharged is to expend more energy. It sounds daft, but it really works. During most of my university career, I was really inactive, but when I started my PhD, I decided to turn that around. It was one of my 2018 goals to improve my physical fitness and thanks to regular running and the occasional session in the swimming pool, I'm getting there. Exercising really helps me to clear my head. When I'm huffing and puffing attempting to run up a hill without losing too much pace, my brain isn't capable of thinking about anything other than putting one foot in front of the other. Well, thoughts of "oh my god, this is HARD, why am I such a masochist?!" do feature quite regularly, but you get the picture. Exercise is an amazing distraction from everyday anxieties and worries and I find that once I've been outside for a little while burning a few calories, I can come back to any troublesome task with a fresh, open, and recharged mind. Working up a sweat really gets your energy flowing. Whether you do it for just 10 minutes per week or for an hour every day, all exercise is good exercise. It helps me both mentally and physically. For me, reading is an escape into another world. As you can probably tell from my monthly Blogger Book Nook posts, reading is a big part of my life. I just love immersing myself in a fictious universe, whether it's stepping back in time into historical landscape or delving into a mystical world full of fairies and magic. If sitting down to read really isn't your thing, picking up an audiobook is a great alternative - nothing chills me out more than being read to! There's something special about picking up a physical book as well, since this pulls you away from the omnipresent phone and TV screens, meaning you're not distracted by work emails or drawn into conversations with friends during your me-time. I always feel recharged once I've taken time out of my day for reading, and this is backed up by science too. A Sussex University study found that reading reduces stress by up to 68% through reducing both your heart rate and muscle tension. If that's not a good enough reason to hit up your local library, I don't know what is! Anyone who is naturally introverted like me knows how physically and mentally draining being around other people can be. Recharging emotionally is therefore just as important as recharging physically. Taking some time to enjoy your own company is immensely valuable, it is a centering and grounding practice that enables to you re-enter the social world afterwards feeling rejuvenated. How you spend this alone-time is entirely up to you, whether it's staying in bed, walking in the park with your dog or camping out on the sofa with snacks and Netflix. The beauty of alone-time is that you can do whatever you want, whenever you fancy it, indulging all of your guilty pleasures without fear of judgement. I like to spend this time really focusing on what makes me happy and I find it incredibly fulfilling as well as rejuvenating. There's no shame in enjoying time spent by yourself! How do you like to recharge? Leave a comment and let me know. Check out my glorious April advertisers! *This is a collaborative post with Groupon.